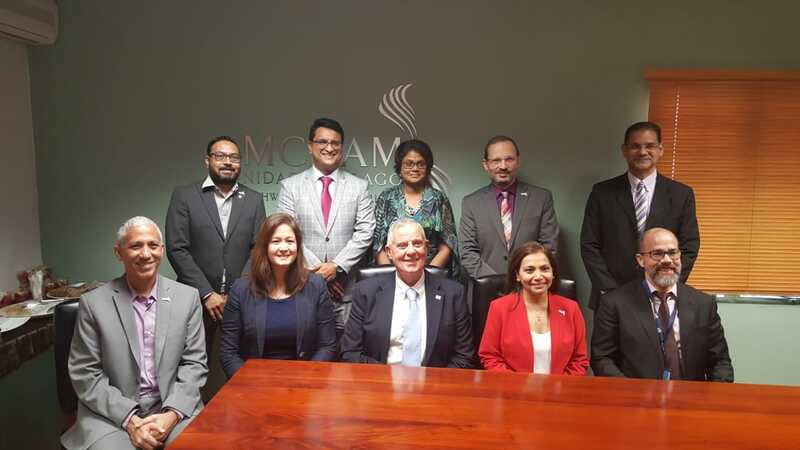 Members of the AMCHAM T&T Board with US Ambassador Joseph N Mondello. Photo courtesy AMCHAM T&T. Patricia Ghany, President AMCHAM T&T and Chief Financial Officer – Esau Oilfield Supplies Limited; Simon Aqui, Business Development - IBM; Gayle Pazos, Vice President & Chief Risk Officer - Scotiabank; Mitchell De Sliva, Citi Country Officer and Managing Director Citibank Trinidad & Tobago; Dominic Rampersad, President - Phoenix Park Gas Processors Limited; Glenn Hamel- Smith, Partner, Head - Banking & Finance - M. Hamel-Smith & Co.; Sana Ragbir, General Manager - First Citizens Investment Services Ltd; and Erojus Joseph, District Manager - GE Oil & Gas.